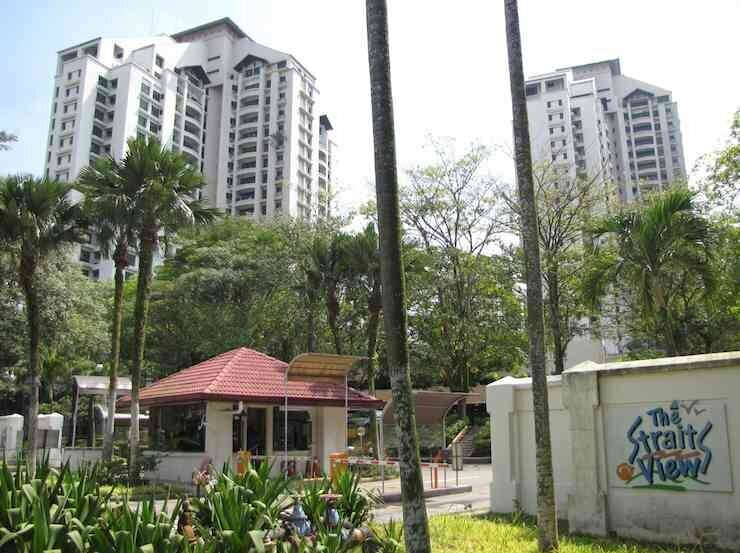 The Straits View Condo is one of the choices among expats living in Johor Bahru, Malaysia. The new bypass to the causeway opened in 2012 has drastically reduced commute time to Singapore. The units are all large (around 1,600 square feet with 3 bedrooms and 3 bathrooms) and there are a limited number of layouts (4, I think). 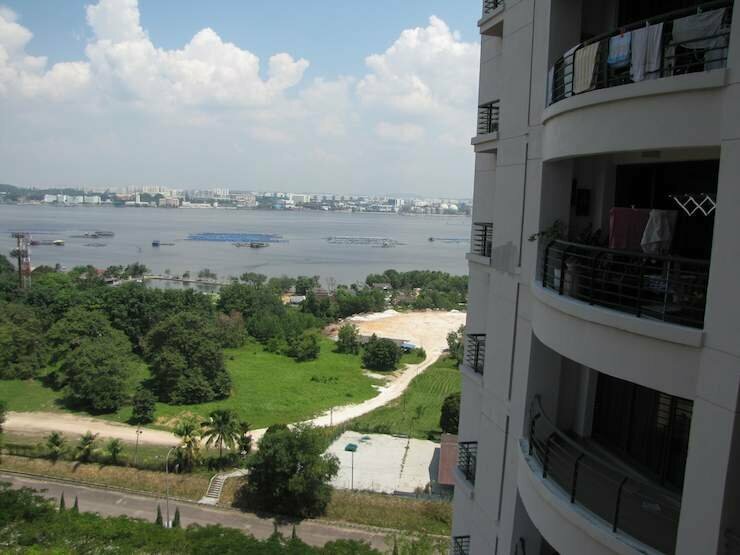 Many feature views of the Straits and Singapore, many others do not have that view and look over the Permas Jaya golf course or the pool instead. To me the buildings seem well done and the layouts of the units are very good. The area seems like it would be fairly quiet as there really isn’t much within a couple blocks other than the golf course. The sea view from balcony at the Straits View Condo. I wanted to get the other balconies in the photo (to the left of the photo you have a good view of the straits and Singapore in the distance). Each unit will have one large balcony and all the bedrooms have nice views. The kitchen is large and there is also a washroom (for washer and dryer, storage…). The units also have 2 doors to enter and exit (one is an obvious front door entering into the living room). Straits View has a large swimming pool that appears to get more use than many of the other swimming pools. From what I have seen Europeans use the pool more than others, especially in the middle of the day. The condo also has 2 tennis courts. Straits View is located in Permas Jaya, about 10 minutes away from CIQ now (without any traffic jam). About 5 blocks away is a Jusco with maybe 10 places to eat a few other stores. The Jusco is a hypermarket (supermarket, plus more) is very well run and has very good prices from what I saw. Across the street from the Jusco are a few blocks of shops, restaurants, small hotels, the new Renaissance Hotel, bars, beauty salons, etc. The area was a pleasant surprise for me, it was not as isolated as I feared. 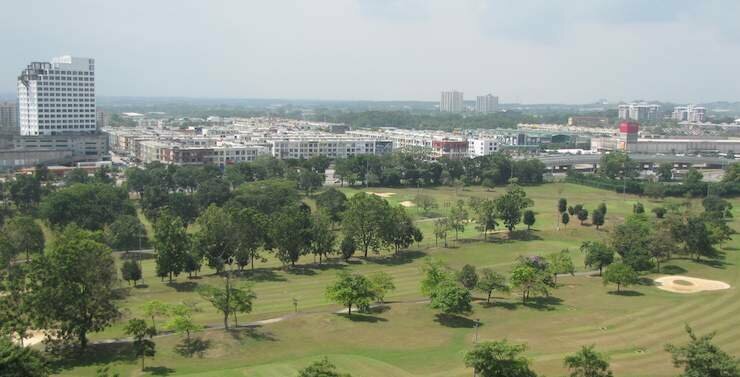 Looking toward the golf course and Permas Jaya. Jusco is off the right (the red sign on the far right) the shop area can be seen to the middle and left and the large building on the left will be a Marriot hotel. Most expats will have cars, but you can also catch a bus to the center of Johor Bahru for about RM 2 and a taxi for about 15 RM (about US$4). Most buses seem to go to City Square, near CIQ. At least some condos in straits view have full bathtubs (maybe all?). Every Sunday night there is an open air market in the shop area (closest to Strait View). Straits View does not have a basketball court. There is a basketball court maybe 2 km away at an athletic center (with a pool, tennis courts, badminton, etc.). You can expect to pay RM 4,000+ a month for a high floor see view, and probably 3,000+ for a condo without a sea view. They are building a 6th tower now. Prices range from about RM 3,000/mo. to RM 5,500 a month. 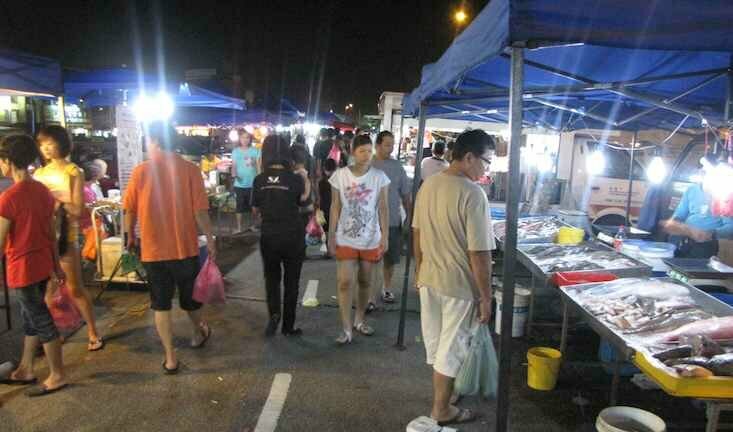 Sunday night market in Permas Jaya, Johor Bahru. There is wonderful prepared food in addition to seafood to buy and prepare yourself.